It is my philosophy that every book worth reading has a monster. It doesn’t have to be a monster in the traditional sense - of course that is the best kind! 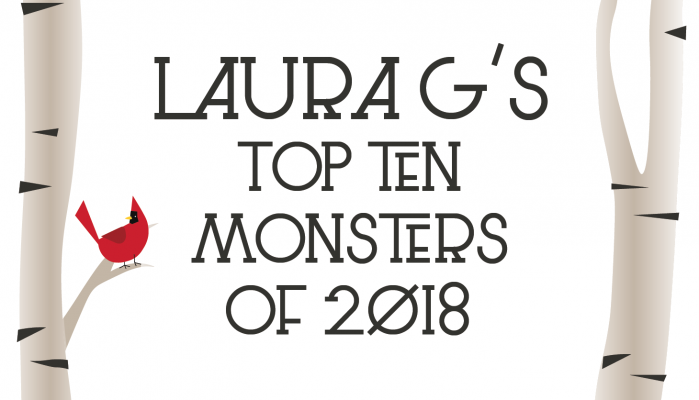 So without further ado, here is my list of the Top Ten Monsters of 2018! Everyone knows I adore Daisy Johnson’s writing. This newest book is no exception. Intense, evocative, and lush, EVERYTHING UNDER shocked me with its lyrical prose and twisting, intricate plot. My favorite part? The unknowable monster called the Bonak. Never seen, only heard, the Bonak is fear incarnate. This is a monster of epic proportions. STRANGE GRACE blew me away with its gorgeous prose and mysterious setting. Three narratives are tied together through hope and pain, culminating in an explosive finale. While the romance is perfectly untraditional, the monster is old school: the Devil. Years ago a village made a pact with the Devil to ensure their survival. The payment? One human soul every year. This modern Southern Gothic is an inverted exorcism tale. The book follows Claire, a girl possessed by a demon she calls Her. But when Her is exorcised from Claire, she has to try to get her beloved demon back. This is an interesting twist on the classic demon/possession narrative, discordant in the best way possible. THE BONELESS MERCIES is a dark and thrilling take on the epic BEOWULF! The characters are powerful and raw, the story bloody and wrenching. As with the rest of the characters, even the monster is gender bent as Grendel becomes Logafell. Deadly, vindictive, and highly difficult to kill, Logafell is the perfect monster to antagonize these fierce women. This book is one of the most original Middle Grade novels I’ve read in years. A boy wakes up on an abandoned beach. He doesn’t know who he is, where he came from, or how he got here. But he is being stalked by a mysterious and dangerous Beast.This Beast, like all great monsters, forces the boy to face his fears and grow from his experiences. I would consider this monster “cheating” if I hadn’t read the book. But the further you fall into this dark and twisted tale the further you realize that the Human Psyche is a tangible character within the story. Further, it is a veritable monster. IN THE HOUSE IN THE DARK OF THE WOODS is a haunting exploration of loneliness with no foreseeable end. THE BRILLIANT DEATH is one of the most original novels I’ve read recently. The premise was already amazing, but I fell in love with its in-depth and fearless exploration of gender fluidity. The world is richly imagined with a monstrous mafia-esque villain. This was an absolute delight! White’s novel delves deeper into the Frankenstein story, making Dr. Frankenstein himself the monster. How does a monster become so? Is rehabilitation possible? This book is a true horror as Elizabeth's quest for her friend’s salvation drags her further toward becoming a monster herself. The world in SHADOW OF THE FOX is richly imagined, inspired by the myths and culture of feudal Japan. As with all excellent Japanese myths, the story is fraught with oni and kami, Japanese demons made terrifying by their seeming endlessness. Defeat one, ten more rise in its place. If you love battle scenes, this book is for you! This bilingual picture book follows the tale of Latin America’s most fearsome monster: the goat-eating chupacabra! Funny and exciting, this is a monster for all ages!